Gaelon and Micah Manquen were romping through the house, looking for new hiding places for Hide And Seek. They had already explored behind the couch, the bathroom shower, and under all the beds in the house. Next stop was the pair of closets in Mommy and Daddy’s bedroom. First they explored Mommy’s closet, but it was loaded full with shoes and dresses, leaving no place to hide. Daddy’s closet had fewer clothes, but there was something on the floor behind the clothes, something looking like two steps. They moved the clothes aside and indeed there were two steps leading up to a small wooden door cut into the back wall of the closet about 2 feet above the floor level. They carefully unfastened the metal latch and slowly swung the door open. The attic beyond was almost dark, but a bit of light filtered in through a vent at the far end. “Grab a flashlight” whispered Gaelon, and Micah scurried to grab Daddy’s earthquake flashlight next to his bed. As they peered into the darkness, flashing the beam of light from side to side, they discovered a huge magical world of houses, autos, people, railroad track and trains…. 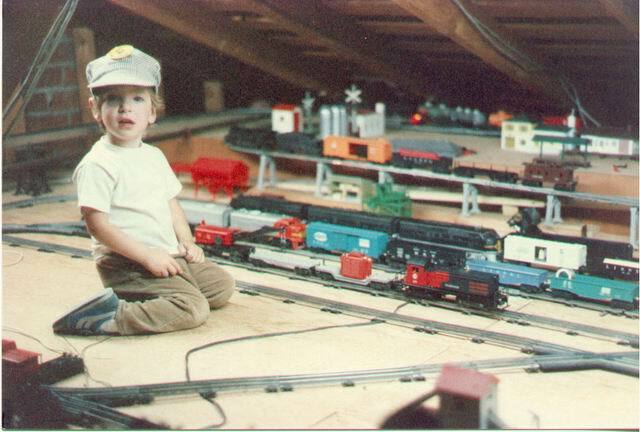 The train attic is above the living room, dining room, kitchen and entryway, covering about 700 square feet of area. After my father cut and framed the 30” x 30” doorway, the first improvements were a light and two 4’ x 8’ sheets of plywood. In some areas of the attic the plywood rests directly on the ceiling joists, but this requires that the Romex wiring cables be re-routed through holes drilled in the ceiling joists. Later areas utilized furring strips on top of the ceiling joists, and the Romex is run through gaps in the furring strips. The original 2 sheets of plywood have multiplied to cover virtually the entire available area. The maximum height at the center is only 58” from the floor to the underside of the peak of the roof. The original roof was cedar shake shingles, and the nails holding the shingles protruded through the roof about 2 inches. It only took a few scratches on the head to teach us to wear a hat. This hazard was eliminated in some areas when I installed 1” thick sheets of high-density Fiberglas panels on the underside of the roof. I had gotten these sheets from a recording studio that was closing down. They are very expensive and I only got about 8 4’ x 8’ sheets. I inset them between the roof rafters to maintain as much headroom as possible. I later switched to Styrofoam sheets when it was time to pay for additional panels out of my pocketbook. In addition to head protection, the panels and white paint on the roof rafters provide a white ceiling for good light diffusion. The heat insulation property of the ceiling panels is also very important. 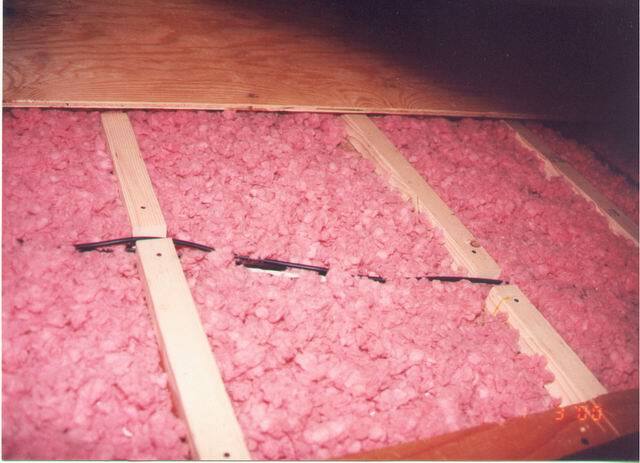 During hot mid-afternoons in the summer the temperature in the attic will soar to over 100 degrees, but the insulation keeps the temperature below 80 degrees until about noon. The work crew needs to get on the job early to avoid the heat! In the evening a fan blows outside air from the attic vent onto the ‘sweet spot’ at the main control panel. 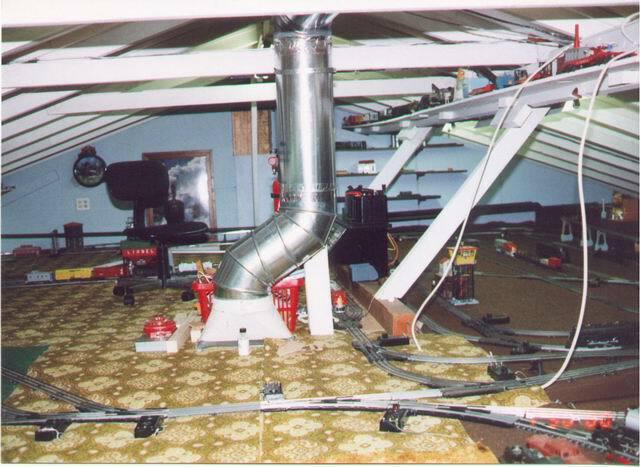 A couple of years ago, after numerous complaints from my girlfriend Chris (who likes trains), I undertook a major remodeling to reroute the forced air heater ducting that ran through the attic, blocking my line of sight and access to parts of the attic. I built a custom flat duct that routes the hot air to the peak of the roof in the space between two rafters. A round duct along the attic ridge transfers this air to the center of the attic, where it turns down and injects the air into the living room and dining room registers. This modification opened up about a hundred square feet of space that previously had been totally inaccessible. Most of the floor is covered with green or brown short-pile indoor/outdoor carpet. The carpet provides some sound deadening and covers short runs of wiring. Longer runs pass under the plywood. Working on the floor of an attic has several negative factors, and the poor access to wiring is near the top of the list. Another problem is that the low areas along the eaves create problems with trains hitting the roof rafters if the track is too close to the periphery, and that area has terrible accessibility unless you are a contortionist. Prolonged attic work sessions are hard on the knees, and I do use rubber kneepads to minimize this problem. 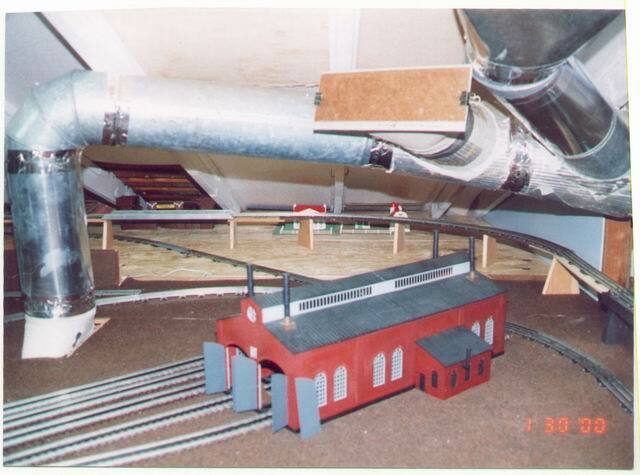 Another problem is that all access is by crawling across the top of the layout, and this requires access lanes through the accessories, buildings and trackside structures. Another problem with this attic is the structural beams that are required to support the long ceiling joists in the living and dining rooms. 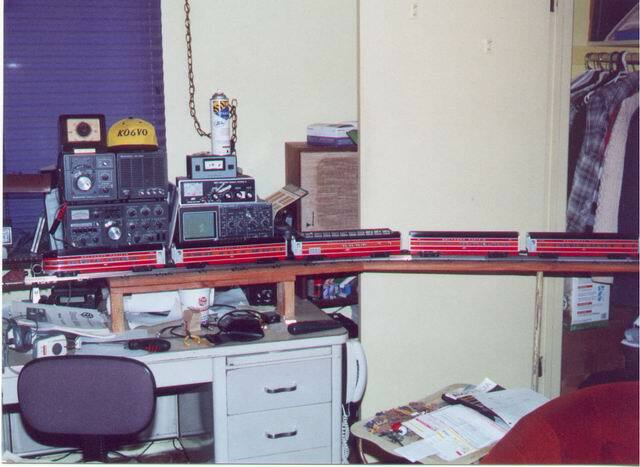 These beams stick up as much as 10 inches, requiring the trains to climb some grades that are as steep as 4%, twice the generally accepted slope for model trains. No, you can’t just cut passage slots in these beams without risking a collapse of the ceiling below, and in earthquake country we need all the structural integrity we can get! Life would be easier if I only ran new rolling stock with needle point axles and fast angle wheels to reduce friction, but most of my rolling stock is Post War. I run a lot of multi-motor diesels and a Williams Big Boy when I need power on the hills. By the way, I laugh at all the comments from guys who think that the new constant speed control is the way to go. I much prefer the challenge of laboring up a hill and then avoiding a runaway on the downhill run, just like real trains. Six 2-tube fluorescent shop lights provide lighting. Four of these units have been converted so that the two tubes are mounted end-to-end to yield a lamp that is 8 feet long. These long fixtures are mounted on the rear of support beams that hold up the roof rafters at midspan, yielding indirect lighting over most of the layout. for up to 60 accessories, switches and green/red indicators for 60 turnouts, and power control for 27 blocks and sidings. Eleven of the turnout control are not currently utilized but the four Gargraves turnouts in the engine house yard area are not yet remotely controlled. Power comes from an old Lionel ZW, a KW, a V and two small fixed transformers that provide power to the turnouts and most accessories. The track configuration uses both O31 and O72 track radius. The lower loops directly in front of the operating panel features an embedded Figure 8 that permits reversing the direction of a train in either direction. The Figure 8 was also popular with my boys when we ran up to 4 Scout motor assemblies simultaneously in our own version of the stock car Figure 8 races. 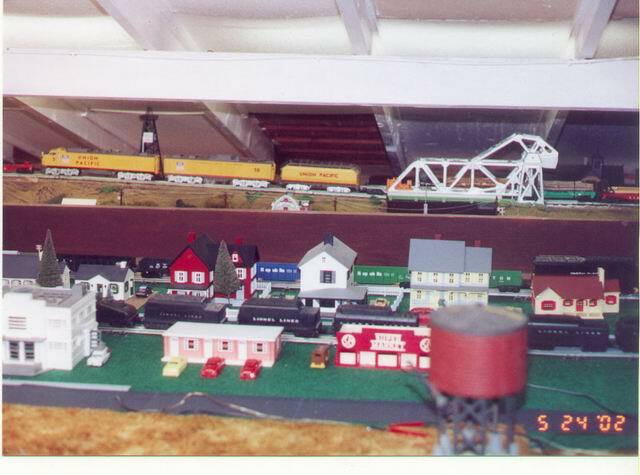 The inner lower loop also has two pull-through sidings and a motorized Marx bridge. The outer lower loop is also a Figure 8, but the center crossover takes place at flyovers on the 4% grades climbing up to the main loop. 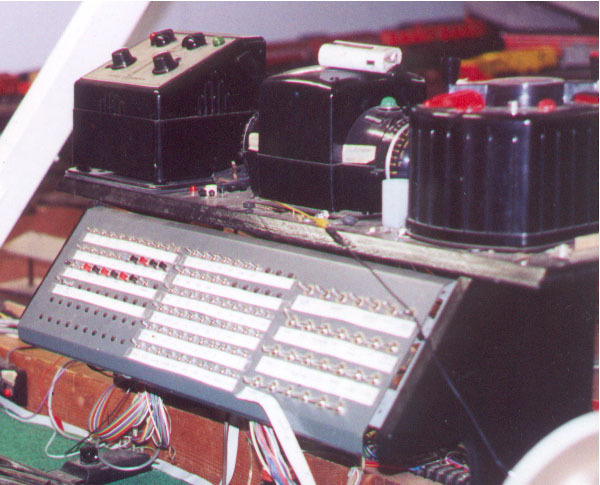 Each of the inner loops has a dedicated transformer control. The outer loop is strictly O72 for running long trains and big locomotives. The loop meanders around the outer edges of the entire attic for a total of about 90 feet with significant grades to cross over the structural beams. An additional O72 route crosses through the center of this loop and also includes a side loop that provides reversing in one direction. I have not yet figured out how to add a second reversing path for the other direction. Behind the operating area is an array of O31 pull-through sidings, a small reversing loop and a ‘T’, permitting a wide variety of train routing. The longest of these sidings are 11 and 12 feet, providing parking for long trains. 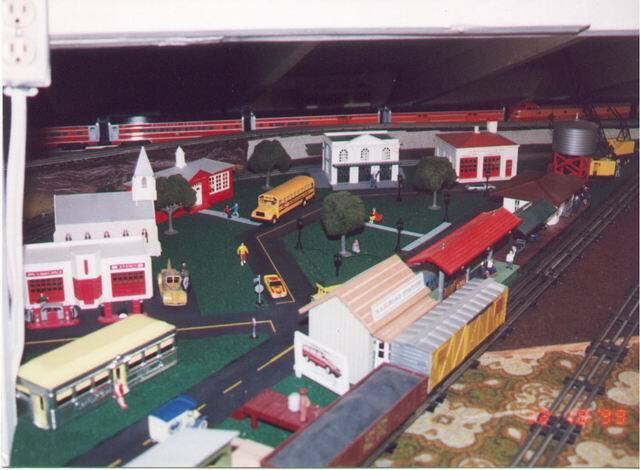 Scenic areas are scattered around the layout. The outer loop crosses above a river scene twice, first on a Bascule bridge and again on a girder bridge. Along the river you can find our split-level house with a tall ham radio tower in the back yard. school, town hall, fire station and, of course, the railroad station. Urban sprawl has overtaken Crescentville, and the town is now growing to the east with additional housing, a hospital, the ‘No Tell’ motel, and other structures under construction. The neighboring community of Christon hasn’t started to grow yet. Christon’s railway station sits all alone, but if the nearby wildcat oil well strikes oil, things may begin to boom! 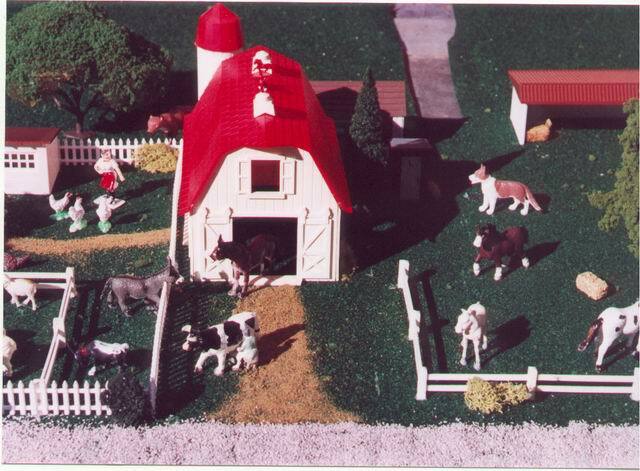 A few rural areas still survive, and one features a farm scene with an elegant farmhouse, a barn, stables and sheds and plenty of animals. 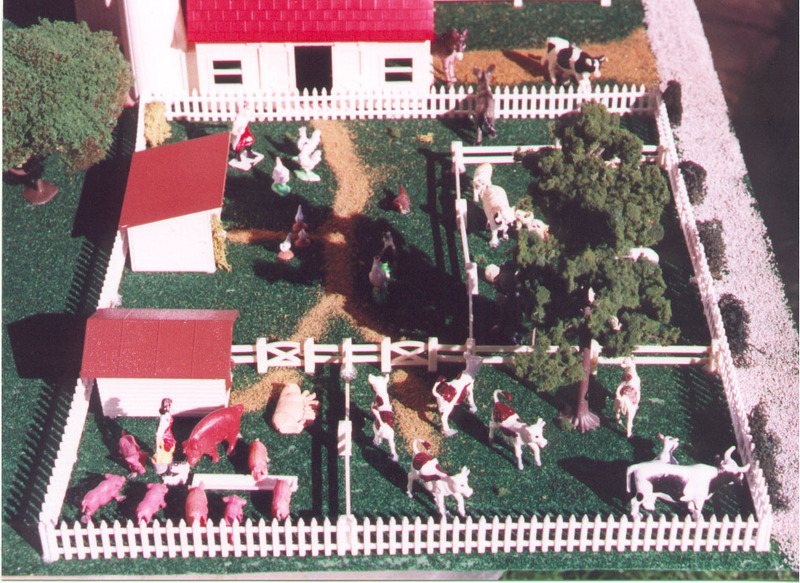 A neighboring ‘early rural’ scene features a cavalry fort and Native American encampment. My girlfriend also complained a lot about a 1” gas line that ran across the attic. The pipe was several inches off the floor, high enough for trains to pass under, but she didn’t like the intrusion of the pipe into the fantasy world. My solution was to turn the unsightly pipe into an elevated railway. I covered the pipe with 2 8’ galvanized steel studs that are used for modern ‘woodless’ drywall construction. Painted black, the U-shaped studs were inverted to form the roadbed and the track is attached to the top of the studs. Wooden pillow blocks clamp the studs to the gas pipe. The ‘El’ has platforms at each end and an operating MTH platform with disappearing passengers in the center. 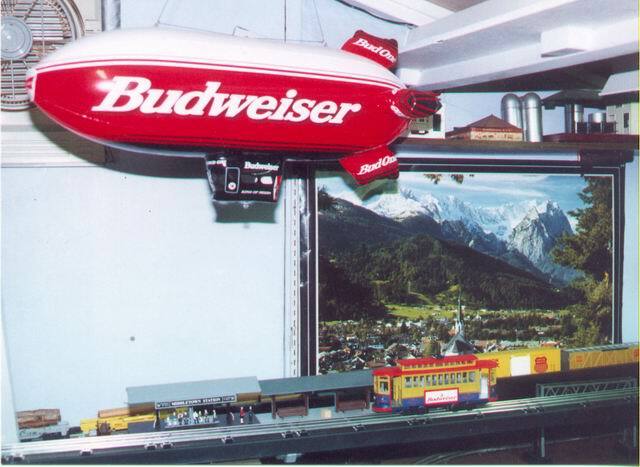 Flying over this platform is the red Budweiser airship, searching for the passengers that disappeared from the Budweiser trolley. 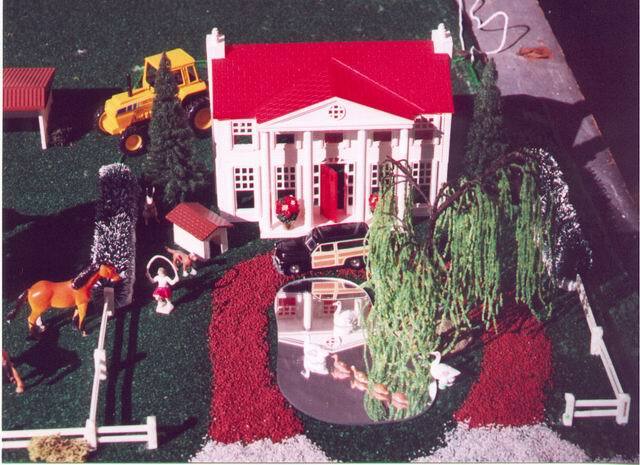 Current projects include more work on the suburbs of Centerville, finishing the area around Christon, and constructing a yard in the bedroom that will feature closed circuit TV and TMCC to facilitate operation from the attic control station. I have just begun to implement TMCC, and considering the cost of converting all my locomotives, I imagine that this project will move very slowly. I hope you enjoyed our tour of my attic wonderland. Please come back and browse around again. Please drop me a note if you have any questions or comments. 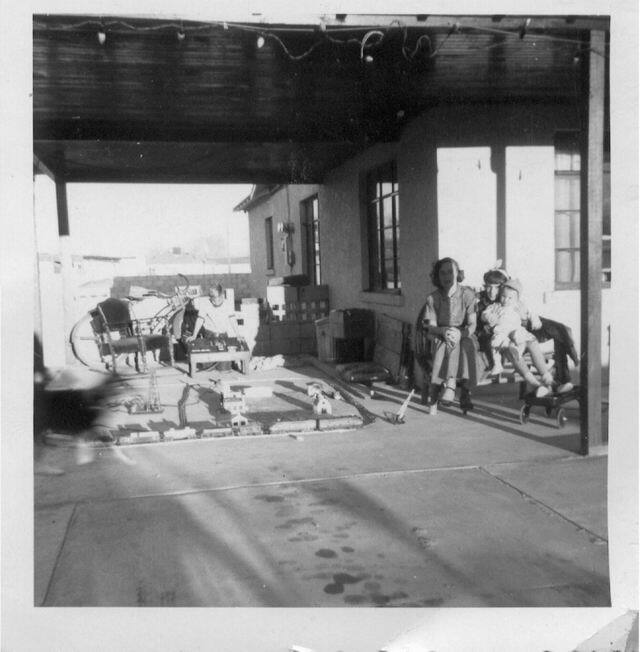 Here is a photo of me with my Lionel trains 50 years ago in Las Cruces, New Mexico. That is a NYC F3 pulling a dump car, tank car, gondola, flat car and a caboose. I think there is also a steam passenger train off to the left. The control panel is a V transformer with controls for 2 RCS remote control tracks and a pair of switches. 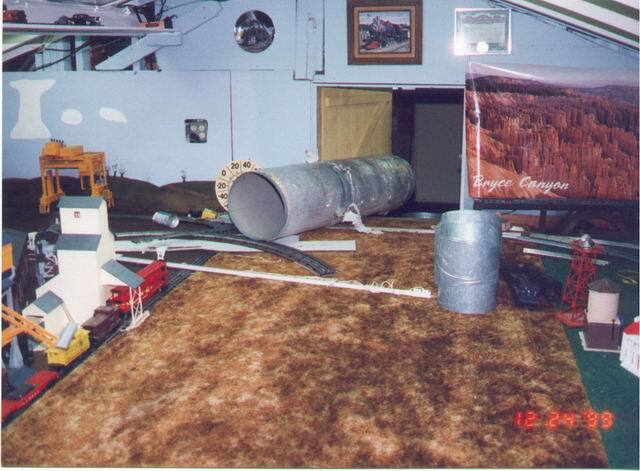 Scattered around the layout are an oil derrick, a crossing gate and an assortment of Plasticville buildings. 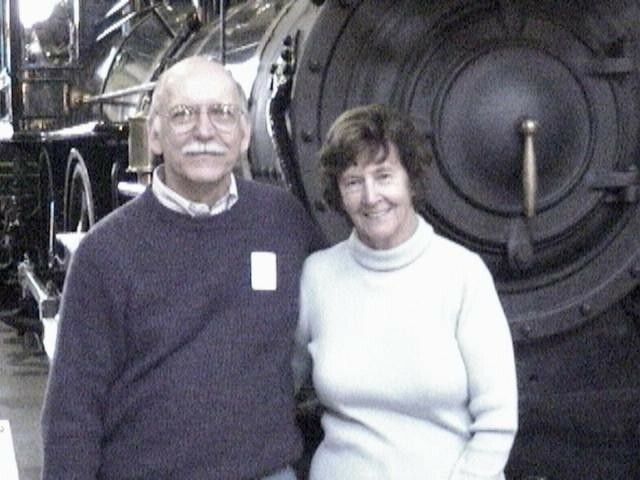 This picture of Chris and me was taken at the B&O Museum in November of 2001. Haven’t changed a bit, have I?